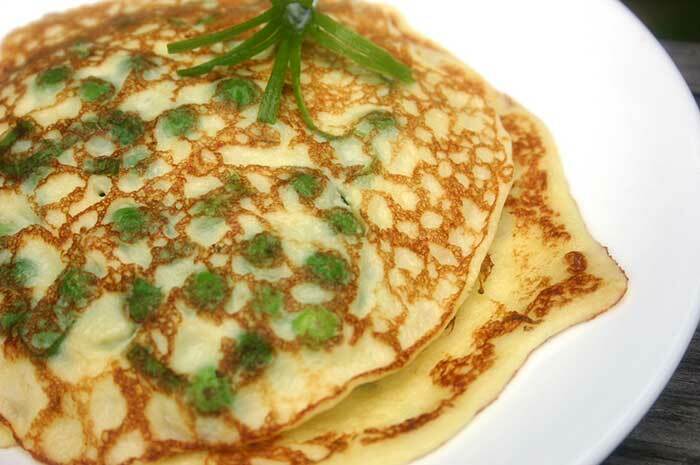 When I was cooking these pea pancakes, I accidentally ripped one in half. Of course, I had to eat it. I certainly didn’t want an ugly pancake on my platter in the midst of all of the pretty ones. I was tempted to make more messy ones, let me tell you. I couldn’t believe that such a simple recipe could have so much flavor even without any sauce. Even though this recipe serves four, the Grillmaster and I demolished the whole batch in record time. I didn’t feel too guilty since the pea pancakes are amazingly high in protein and relatively low in carbs. 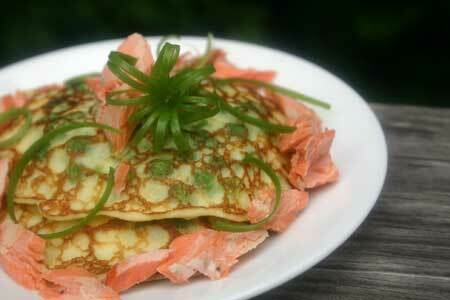 I served these pancakes with some leftover grilled salmon and just a dot of butter. The cottage cheese makes them so moist, you can easily skip the butter if you want to cut back on saturated fat. If you want a gluten-free option for cottage cheese pancakes, check out TheFitBlog’s recipe (use gluten-free oats). I’m thinking I’ll try a little bit of mint mixed with the scallion garnish next time if I’m salmon-less. Peas and mint are a classic combination. If using fresh peas, cook in boiling water until tender, about 3 minutes; drain. If using frozen peas, thaw but do not cook. Purée eggs, cottage cheese, flour, olive oil, and salt in blender or food processor until smooth. Transfer batter to bowl and stir in peas plus about 3/4 of the scallions. Heat a nonstick griddle over medium heat. Once it’s hot, remove from heat and spray with cooking spray. (Don’t spray near the burner!) Return to heat and use a 1/4 cup measure to pour batter onto griddle. I can fit four pancakes on an 11- x 11-inch griddle. Once pancakes have set on the bottom, flip and cook until golden brown and done in the middle. Remove to a platter and keep warm while you make the remaining pancakes. Spray the griddle with cooking spray (off the heat) before each batch. 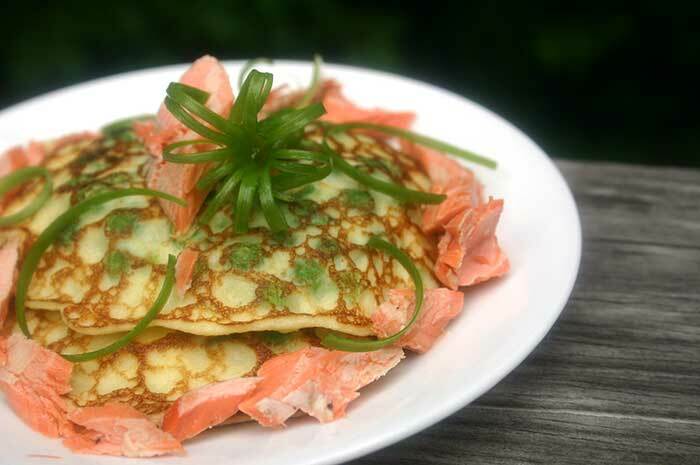 Serve pancakes with salmon on top or with a tiny bit of butter. Garnish with remaining scallions. Watching sodium? Skip or reduce the amount of kosher salt. Also, look for low-sodium cottage cheese. Nutritional information was calculated with egg substitute instead of eggs and without the optional ingredients. yum! what a great idea. trying this soon – or a reasonable facsimile, knowin’ how i tweek!